EcoSphere review: simple glass ball or new technologies? EcoSphere – lots of living creatures inhabit here, tightly encased in a glass ball. Year after year. At that there is no water changes, feeding or air required. It needs only indirect light. This small enclosed world will gladly tell anyone about such a fragile nature balance. 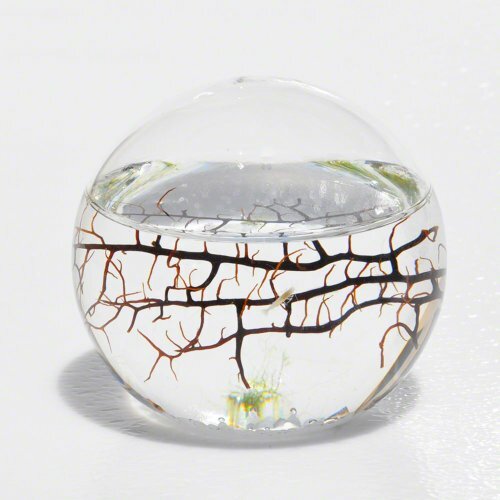 Ecosphere glass ball is a miniature model of our world. Sadly, it can be destroyed, as well as a real planet. This is definitely not a brand new idea, thus it’s rather fascinating. Besides, it has a very interesting story behind. 3 So, what is an ecosphere shrimp? 4 Another question is why a shrimp? Why Hawaiian shrimp? «EcoSphere» was invented about 25 years ago by two scientists from Jet Propulsion Laboratory – now-dead Joe Hanson and Clair Folsome. This invention was kind of side effect that occured during the studies of ecosystem enclosure aimed for long duration space missions; in such system it was necessary to keep the balance of all substances with very high precision, since a ship could receive only energy from the outer space during a flight. Of course, science-fiction writers have been describing space greenhouses and farms in their books for quite a long time already. However, the question that had no answer was – how to create a completely self-sustaining and self-contained system of substances transformation in an enclosed space? Naturally, it was necessary to calculate accurately within milligram all biochemical chains of all living creatures that take part in a cycle of matter within the system. This way there was found a very interesting combination of sea algae, shrimps and certain bacteria, which could feed each other “in a circle” for indefinitely long time as long as their tiny world was being exposed to light. “EcoSphere” has been produced and sold as a souvenir for over 15 years already by the American company Ecosphere Associates, which once got this technology from NASA Recipe for an EcoSphere from NASA. These glass sphere for sale and “eggs” can be from 10 cm to 1 m large in diameter. The largest samples were made for museums, exhibitions and so on. Prices of popular table models ( from 4 to 9 inches in diameter). Inside the «EcoSphere» there is a little gravel, some sea fan branches, precisely measured amount of filtered sea water and air, algae, some shrimps and a legion of bacteria. The algae grow in sunlight consuming carbon dioxide and producing oxygen. The shrimps breathe oxygen and produce carbon dioxide and eat algae and bacteria. The bacteria feed on the shrimps waste products and again they produce carbon dioxide supplying the algae with all necessary substances. Thus the circle is closed. One may think, that the glass ball needs no care, however, all the fun about this educatory souvenir is that without it’s owner’s attention it’ll die. At least shrimps will die first, algae will hold on a bit longer. The thing is, that to keep the biochemical reactions balance the ecosphere closed aquatic ecosystem needs some specific amount of light: 6-12 hours a day, at that it must be only reflected scattered light, no direct light ever. Therefore fluorescent lamps may be used for this purpose. If there is not enough light, the algae will start dying and this way decreasing the amount of food for shrimps. Then the shrimps will start starving and dying from hunger. If there is too much light, the algae will grow fast and there will be to much of them, the water pH will become higher and the shrimps will die as well. Control of this self sustaining temperature is a must as well. It should be between 60 and 85 degrees Fahrenheit (15C-25C) and it shouldn’t change abruptly. If you ignore even these easy requirements,sadly, irrecoverable thing may happen. For example, let’s remove the glass ball from light. The plants will start dying without it, the shrimps will stay without any plant food and start stifling from lack of air. The bacteria will stay alive longer than others, but they will also die in the end. However, too much of light and rough temperature changes are also ruinous for so called shrimp ecosphere. So, how long can glass ball live? A small one – for about 2-3 years, a larger model – longer, correspondingly. Ecosphere shrimp lifespan exceeds 5 years. Specific results depend on observing the conditions as for the lighting and temperature. The company has some samples which are more than 8 years old and yet still pretty alive and active. There also some models, where shrimps have died, but algae is still alive and it has been living in this glass ball for over 18 years. Here, we should mention that only algae and bacteria breed in ecospheres. The shrimps number stays the same first, but later it gradually decreases. However, during the company’s history the cases have been seen when the shrimps started breeding, but as the project creators report – such cases happen very seldom, they are more likely to be exceptions. If you buy an ecosphere aquarium, it will be not just an original souvenir, since it is an amazing world, in which there is a balance and harmony among flora and fauna representatives. Provided with proper care this shrimp will bring you joy and delight the eye for over a year. Ecosphere pod is like a biological battery. The energy it obtains from light is being transformed into photosynthesis biochemical processes: the algae by consuming carbone dioxide start producing oxygen when they are exposed to light. The shrimps in their turn when breathing oxygen produce CO2 ans so called biological waste. The latter with the help of bacteria turns into a nutrient solution for the algae. So, it turns that to close the life and interdependence circle in the ecosphere from shrimps to bacteria we require constant production of carbon dioxide, which is necessary for the algae to produce oxygen when being exposed to light. Such a specific distribution of duties helps the inhabitants to keep and stay in natural balance. So, what is an ecosphere shrimp? In ecosystem it’s inhabitant – Hawaiian red shrimp (Halocaridina rubra – wiki) – traditionally becomes a spotlight. And its not surprising, since due to its bright coloring this tiny crustacean surely can attract all eyes. its size: miniature one, up to 12 mm. coloring: adult shrimps are bright red colored. The shrimps change their color when they get scared and they mimicry their environment colors and become “transparent” and merely visible. Once they calm down, their coloring becomes bright red as usual. Breeding: to breed Hawaiian red shrimp needs hard brackish water, with temperature about 20-23°C, рН 8,2-8,4. Besides, the shrimp needs dark shaded places for this. By the way, since the balance of live and unalive matter must be strictly respected to insure long and prosperous life of the biosphere, the developers excluded possibility of shrimps breeding by making this self sustaining transparent with no nookeries. There some peculiarities in keeping of these shrimps in a tank: they can live both in brackish and fresh water. However, to feel healthy the shrimps need hard water. It’s better to use substrate and volcanic rock stones. Despite the fact that this shrimp is not demanding as for its food or care, it still needs to be looked after: it has to get enough of sunlight and comfortable room temperature. Another question is why a shrimp? Why Hawaiian shrimp? The thing is that during their long-term studies NASA scientists have defined an ideal content for closed aquatic ecosystem using shrimps as its inhabitants. It was due to their vitality and plainness in care, and of course, due to their small size. As for this specific species – Hawaiian red shrimp – it was chosen because these crustaceans unlike others are rather calm and peaceful towards creatures of their kind and they can successfully survive in an enclosed space without any cannibalism.